SSD stands for “Solid-State Drive”, a super-fast alternative for storing critical data. 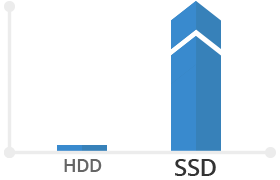 SSD hard disks are much more expensive than ordinary hard disks, but your website or webshop loads up to 20 times faster thanks to SSD hosting! SSD stands for Solid-State Drive, a super-fast alternative to traditional HDD hard disks for data storage. SSDs are up to 20 times faster than traditional hard disks; you will especially notice this when using applications that send many requests with random I/O (input-output) operations. When traffic peaks on your blog, website or web store, an increasing number of I/O requests are sent to your database. Free SSD hosting for everyone! Combell provides a Next Generation hosting platform, which has been developed in-house. From now on, all new Linux web hosting packages will benefit from storage via SSD hosting (by default). We will also gradually migrate the Linux web hosting packages of our existing customers to SSDs. We will take care of everything for you! Thanks to SSD hosting, your website will load up to 20 times faster than with a traditional hosting provider. By the way, SSDs are not the only benefit you will enjoy on our Next Generation hosting platform. Our hosting specialists have tweaked many components in order to maximise the performance of your website, web store or application on our shared hosting platform. Combell also offers SSD on Cloud hosting servers. This service is not provided by default, but it is available as an option in your Cloud configurator. Depending on your budget and needs, you can choose the data you want to be stored on SSDs. Find out more about our range of Cloud servers.